Michael L. Parson was sworn in as Missouri’s 57th Governor on June 1, 2018 by Missouri Supreme Court Judge Mary R. Russell. He came into the role of governor with a longtime commitment to serving others with over 30 years of experience in public service. Governor Parson previously served as the 47th Lieutenant Governor of Missouri. He was elected Lieutenant Governor on November 8, 2016 after claiming victory in 110 of Missouri’s 114 counties and receiving the most votes of any Lieutenant Governor in Missouri history. Governor Parson served the people of the 28th Senatorial District in the Missouri Senate from 2011-2017. He served in the Missouri House of Representatives from 2005-2011. Governor Parson also served as the Sheriff of Polk County from 1993-2005. He also served six years in the U.S. Army. 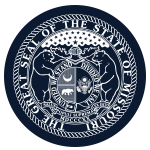 While in the Missouri Senate, Governor Parson chaired the Small Business, Insurance & Industry Committee and during his first two years served as Majority Whip. While serving in the House of Representatives, he was chair of the House Rules Committee. He sponsored and co-sponsored several landmark pieces of legislation including Missouri’s Castle Doctrine, which strengthened 2nd Amendment rights, and the Missouri Farming Rights Amendment, a piece of legislation that changed the Missouri Constitution to guarantee all Missourians the right to farm and ranch. During Governor Parson’s first year as Lieutenant Governor, the Office of Lieutenant Governor launched the “Buy Missouri” initiative, spearheaded an investigation at the St. Louis Veterans Home, and has been a strong advocate for agriculture, veterans, seniors, and tourism. He also was inducted into the Missouri Farmers Care Hall of Fame, won the Missouri Grocers Association Capitol Impact Award, and named Ingram’s 50 Missourians You Should Know 2018 list. Governor Parson has lived in Bolivar with his wife Teresa. Together they have two grown children and five grandchildren. He was raised on a farm in Hickory County, and graduated from Wheatland High School in Wheatland, Missouri. He is a small business owner and is a third generation farmer who currently owns and operates a cow and calf operation near Bolivar.